Understanding mitotic nuclear remodeling from the comparative and synthetic biology perspectives constitutes the main thrust of our current research. Mitotic division ensures faithful inheritance of genetic material in proliferating eukaryotic cells and errors in this process often lead to developmental defects and disease. Cellular genome is compartmentalized inside the nucleus delimited by the double-membrane nuclear envelope. The nuclear envelope must be dynamically restructured during mitosis to allow chromosome segregation and formation of the daughter nuclei. Eukaryotic cells perform this necessary task using a strikingly diverse set of cell type- and organism-specific approaches, ranging from fully “open” to fully “closed” mitosis depending on whether and when the nuclear envelope breaks down or remains intact. The recent focus on a relatively small cohort of model systems has provided only limited insights into the extent and the molecular basis of mitotic variability. By making use of an “experiment of Nature”, comparative and synthetic analyses of related eukaryotes utilizing distinct approaches to mitotic division may add a new, evolutionary dimension to this important field and provide a discovery tool capable of challenging established paradigms and revealing fundamentally novel biological principles. How is the nuclear envelope area controlled during mitotic division? How do cells break and reform the nuclear membrane? What are the rules for generating functional diversity in nuclear envelope management? Aside from the nuclear envelope biology, the two fission yeasts exhibit intriguing differences in several integral biological processes including cytokinesis, cell size control, chromatin organization, and polarized growth. 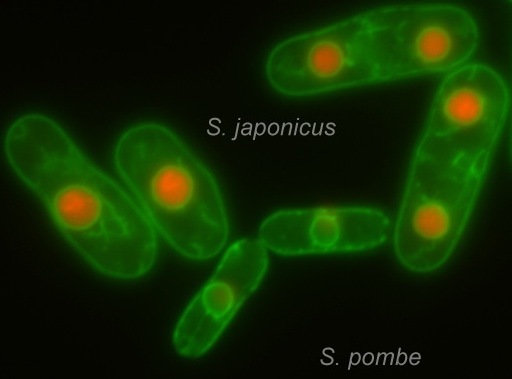 We also use S. japonicus and S. pombe to understand the interplay between cellular division site placement and cortical patterning. We have been developing new avenues of research aimed at understanding the mechanisms underlying differences in overall cell size and cell size homeostasis in the two sister species and the scaling of chromosome compaction during mitosis.